The elbow is a fascinating joint that’s made up of three bones surrounded by many muscles, tendons, and ligaments which work together to form a supportive sling like apparatus. 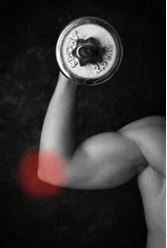 The muscles of the elbow work somewhat like a pulley mechanism lifting and lowering the arm as needed. Making this joint more complex are three important nerves that twist and wind their way in and out of surrounding tissues as they make their way to the wrist and hand. All of these structures can become vulnerable to injury whether the insult is traumatic or repetitive, so it’s important that the entire upper extremity is carefully examined when determining the exact cause of pain in the elbow. Outside of their training in chiropractic medicine, Dr. Zhao and Dr. Pommerehn have additional training in Active Release Tecnniques®, Graston Technique®, McKenzie Therapy®, and Physical Rehabilitation — all of which can target and quickly treat many conditions that cause pain and dysfunction of the elbow. Patients at our clinic are also taught specific home exercises and self soft tissue therapies to speed their recover and reduce treatment dependency. With the above techniques most issues related to the muscle, tendon, ligaments, nerves or joints see significant improvement within the first three treatment sessions. Special diagnostic image tests can also be ordered if needed.